▶ Transfer, backup and manage iPad/iPod/iPhone music, movies, photos, books, etc. ▶ Backup and manage contacts and messages. 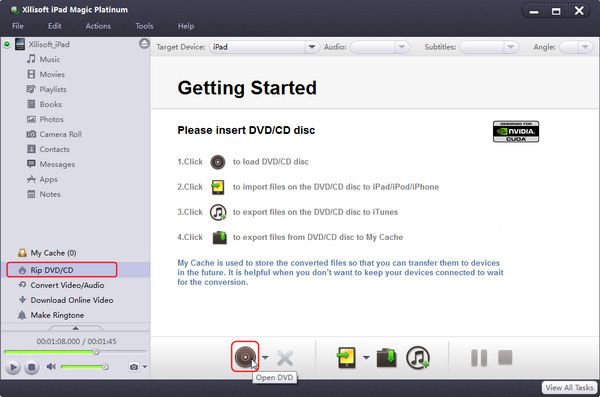 ▶ Convert CD/DVD/audios/videos to iPad/iPod/iPhone. ▶ Download online videos to iPad/iPhone. 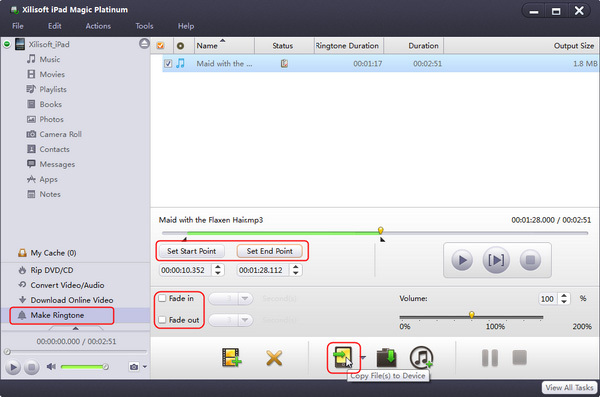 ▶ Make customized iPhone ringtones. ▶ Transfer between iPad/iPod/iPhone and PC: Transfer music, movies, photos, books(PDF and EPUB formats) and iPhone ringtones between iPad/iPod/iPhone and PC, easy and fast. ▶ Backup iPad/iPod/iPhone to iTunes: Backup all files in iPad/iPod/iPhone to iTunes library. Transfer the playlist to iTunes. Support iTunes 11.0 well. ▶ Backup Messages and Contacts: Save messages from devices to PC for backup. Import contacts exported from Incredimail. ▶ Manage iPod/iPhone Multimedia Files:Create photo albums from pictures shot by iPhone, copy photos from photostream to computer; import PDF/EPUB books to devices, build playlists for multimedia files freely. ▶ App Transfer and App Document Management: Transfer application between your PC and iPad, manage document for the application which supports this operation. Now you can drag and drop the apps. 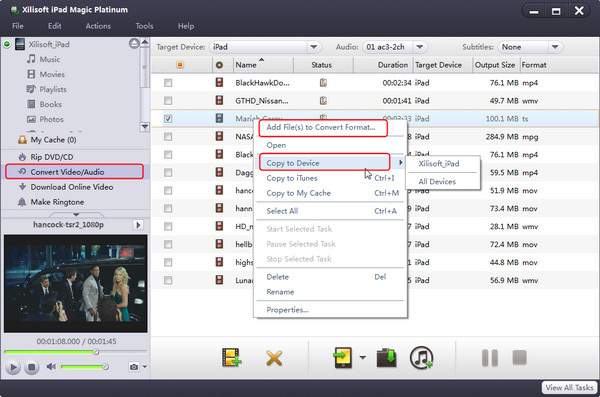 ▶ Connect Multiple Devices Simultaneously: Support connecting multiple devices simultaneously. 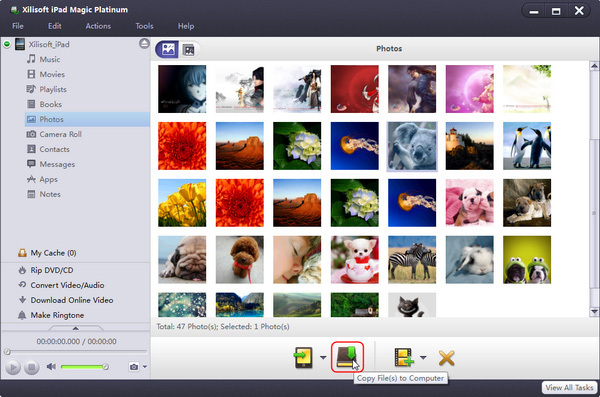 ▶ Support various view types:Show music, movies, photos in various view modes: Song, Albums, Artists, Genres, Composers modes for music; Movies and Genres modes for movie files; photos and albums view modes for photo files. ▶ Rip CD/DVD to iPad/iPod/iPhone Rip CD/DVD, including ISO image files and IFO folders as well to iPad/Pod/iPhone compatible music/movies. 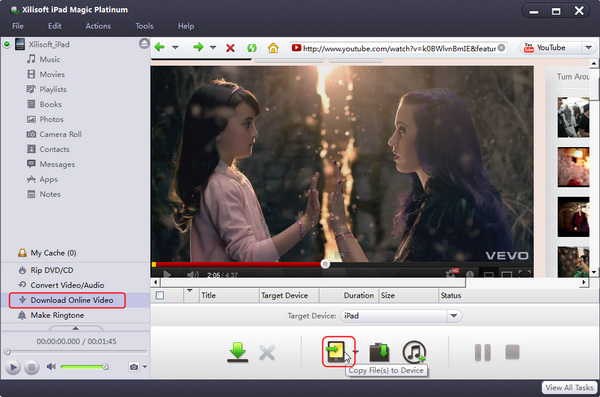 ▶ Convert Audio/Videos to iPad/iPod/iPhone Convert a vast range of audios/videos to iPad/Pod/iPhone compatible music/movies, including M2TS, MTS, AVI, MPEG, WMV, DAT, TS, MPV, NSV, MOV, QT, H261, H264, WMA, AAC, AIF, AIFF, AC3 and so on. ▶ Download and Convert Exciting Online Videos One-step to download and convert online videos from top online video websites, including YouTube, Metacafe, Dailymotion, Break, Vimeo, Revver, Blip, Vidilife and Stickam. ▶ Create Customized iPhone Ringtones Create customized iPhone ringtones from various audios/videos. ▶ Make Photo Albums from Photos Taken by iPhone Make personalized photo albums from the pictures take by iPhone and have a preview. ▶ All iPad/iPod/iPhone Models Supported Fully support all iPod /iPhone models: iPad Wi-Fi, iPad Wi-Fi+3G, iPad 16GB, iPad 32GB, iPad 64GB, New iPad, iPad 4, iPad mini, iPod, nano (5th Gen), iPod nano 7, iPod mini, iPod shuffle, iPod classic, iPod touch, iPod touch 4, iPod touch 5, iPhone, CDMA iPhone 4, iPhone 3G, iPhone 3GS, iPhone 4, iPhone 4S, iPhone 5. Support iOS 6.1 and iTunes 11.0 as well. ▶ NVIDIA GPU Acceleration Option is Enabled Enable NVIDIA GPU acceleration which improves the performance to a great degree. 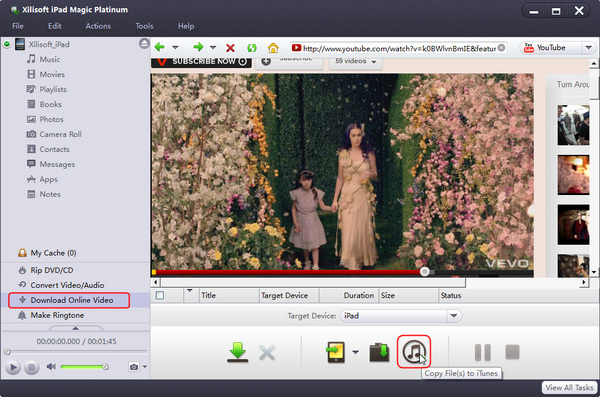 ▶ Preview within the Built-in Player Comes with a built-in resizable media player to preview music/movies/photos. ▶ Optimize Profiles for Imported Files Automatically select the optimized profiles for imported files, efficient and convenient. ▶ Customize the Output of Multimedia Files When converting files, create your own profiles by customizing values of parameters like bit rate, frame rate, target format and etc. ▶ Wi-Fi supported Users can transfer files via Wi-Fi besides using data wire. ▶ Proxy Server Configuration Proxy server configuration allows you to configure the network, HTTP and SOCKS 5 are available. ▶ Shortcut Keys for Operation Shortcut keys are supported to make the operation more conveniently and easier. ▶ Multilingual Interface English, German, Spanish, French, Italian, Japanese, Simplified and Traditional Chinese interface languages are optional. This tutorial can tell you how to transfer media files between iPad, PC and iTunes, copy DVD movies and non-iPad videos to iPad, make ringtone and download online videos by Xilisoft iPad Magic Platinum. And here we would like to note you that all functions of Xilisoft iPad Magic also apply to all iPod, iPhone models, latest iPhone 5, iTunes 10.7 and iOS 6. 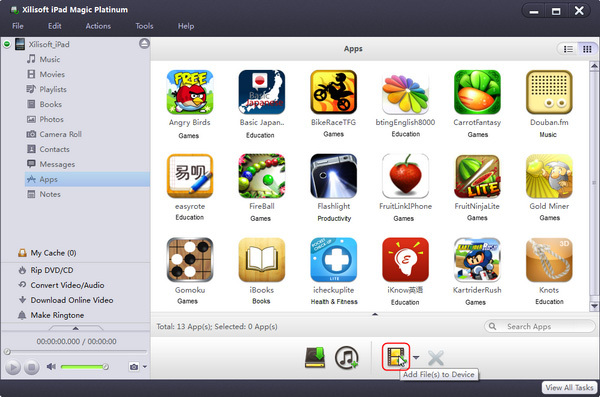 First, download Xilisoft iPad Magic Platinum, install and run it. 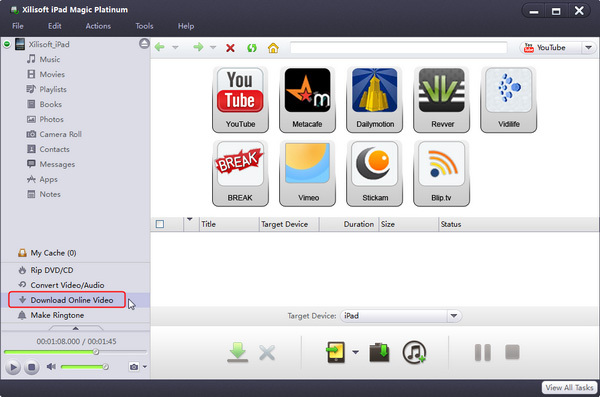 Connect your iPad/iPod/iPhone to computer, the application will recognize the device automatically and displays the device information in the interface. 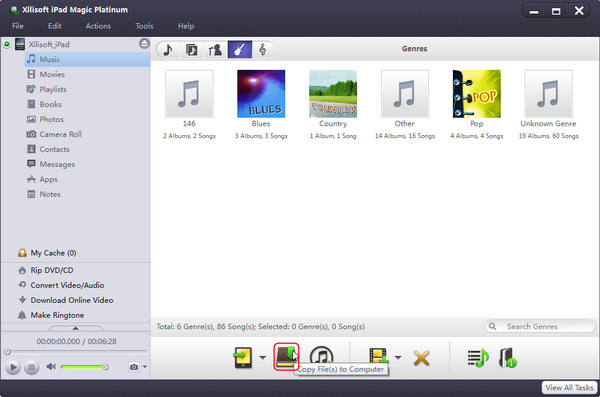 The program helps you transfer iPad/iPod/iPhone music, movies, books, applications and photos to PC for backup. The program helps you put your loved DVD movie into iPad/iPod/iPhone by ripping home DVD and transferring to iPad/iPod/iPhone. 1. Select "Rip home DVD/CD" node from the left directory tree, insert the DVD disc you want to import, and click "Open DVD" drop-down button to load the inserted DVD disc. 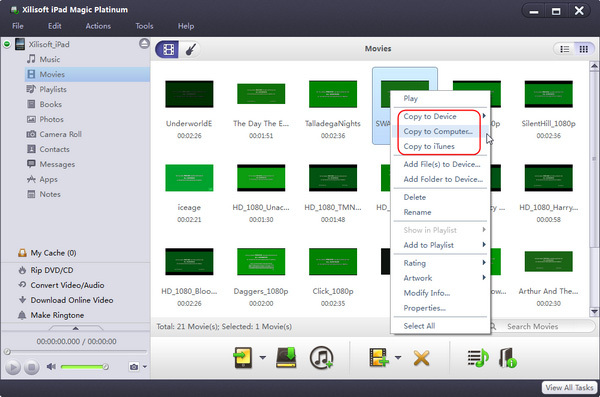 After loading, all DVD titles will be displayed in the right file list. It offers best solution for users to transfer SMS and iMessages from iPhone including iMessages form iPod touch and iPad to PC to back up your important messages.